There is little information available about the early days of law enforcement in Fulton. A man by the name of Charles Frances White worked as “night watch” in Fulton during the late 1800’s. 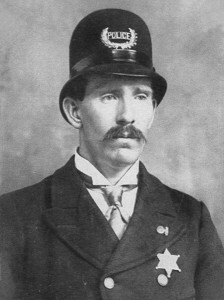 During that era, it was common for police and fire personnel to wear a british-style hat. 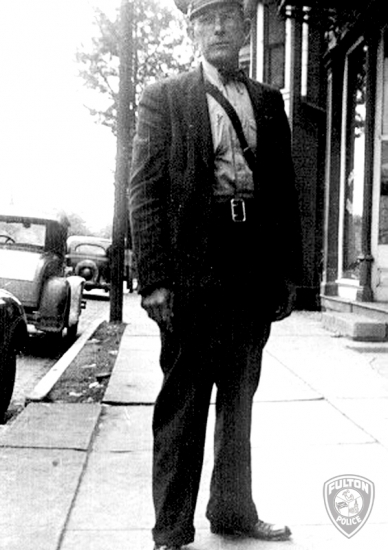 In the 1930’s, law enforcement in the City of Fulton consisted of a town marshal. The last town Marshal was Tom Edson. Back then, the city only issued a gun belt, hat, and badge. The rest of the uniform was the officer’s responsibility. By the 1940’s, the city had adopted an official police department. At the time, the department consisted of six officers including the first police chief, Tom Edson. 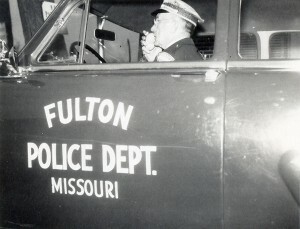 Chief Tom Edison in a Fulton police car. The department owned only one car, which was a 1940’s Chevrolet Business Coupe. The night shift consisted of two officers. Most of the time one of the officers was on foot in the downtown area. Before the use of two-way radios, the city used a light signaling system. 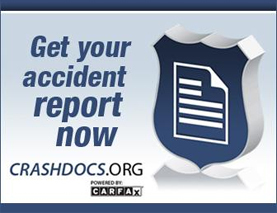 The dispatcher would take a call from a citizen. If the dispatcher, usually a police officer, could not handle the call by phone, they would push a button which activated small red lights on poles in the downtown area. The officer on foot would respond to the station, take the car, and handle the call. He would then return the car to the police department and continue his downtown patrols. The officer on patrol was responsible for checking doors on the shops downtown as well as turning on and off the window display lights. 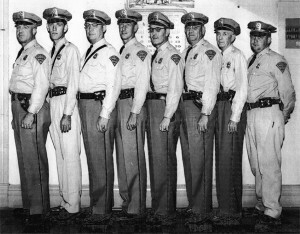 Members of the Fulton Police Department in 1956. By 1956, the department had grown to eight officers, including the police chief. At one time police, fire, and city hall were all located together in the same building, located at the southwest corner of 4th Street and Market Street. By 1963, the fire department had already moved out. The police department had grown to 11 officers and three civilian staff. The police department moved out of the old station about 1968 to a former car dealership building located at 510 Market Street. Assistant Police Chief W.G. 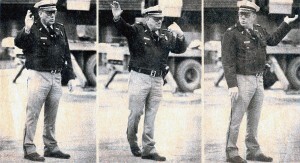 Reifsteck directs traffic at Market Street and 4th Street in 1979. Today the Fulton Police Department has 27 sworn officers, and seven civilian personnel. The Fulton Police Department is a progressive department. which is involved in community policing efforts with two officers assigned to the Fulton Housing Authority. The department has three full-time detectives, one assigned to the MUSTANG drug task force and two assigned to do follow up on cases. We also have a Special Tactical Assistance Team (STAT) unit. These specially trained officers are responsible for doing high risk search warrants and arrests. The Fulton Police Department handled approximately over 17,000 calls for service, made over 4,616 traffic stops, and over 1,500 arrests in 2012. What is glucophage it was necessary only to solve on how many to me these tablets are necessary and whether I will be able without their use. Probably yes but it will be very much and very hard. Side effects of glucophage not everyone will agree to carry out such analysis at himself in the head but it most often is required in order that the person realized a problem and started it solving. I want to personally thank you for visiting the Fulton Police Department web site. I appreciate your interest in learning more about your police department. We developed this web site to help keep you, the citizen, better informed about your police department and to help us work closer together to make Fulton a better place to live and raise a family. Fulton is a fast growing community and to maintain the high quality of life that you deserve we must work together. I hope, in part, this site will help us do that. Myself and each member of the department consider it an honor and privilege to serve the Fulton community. Our goal is to exceed your expectations and never forget that we are here to serve. If at anytime I can be of service to you, please contact me by phone, e-mail or in person at your police department.